The idea behind this bridge was to create an aesthetically pleasing bridge, while still keeping it simple to build. I wanted a really basic arch bridge design in order to compare it to a simple beam bridge that I also built. You can purchase plans for this bridge in my store. You can see from the video that this bridge collapsed from the middle. I think that if the ends of the bridge had been braced like a real life arch bridge, this bridge would have held considerable more weight before it broke. But as a free standing arch bridge made from popsicle sticks, I think it was pretty good. Thanks for this! I did this for a project in math class and I won! Are there other ways to join the popsicle sticks together? Will glue work? Or maybe sticky tape? You can use a couple different methods for clamping the joints. If you have small clamps like clothes pins or binder clips, those work well. You can also simply put weight on top of the joints if they are on a flat surface. Is this really a arch bridge or is it a truss bridge? My science teacher told me the concept is more like a truss bridge’s rather than an arch’s? 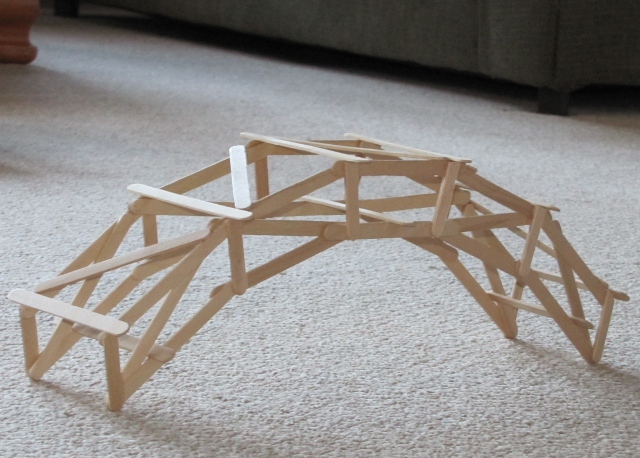 Interestingly, an arch bridge can also have a truss. This is seen in a lot of the models on this website, including this one. And just because it has a truss, doesn’t make it not an arch bridge. This actually gives it some of the advantages of both types of bridges. Do u have a blueprint available for this? Video should now be working. Elegant design. I really like this website Garret, very interesting and helpful. 53 queries in 0.376 seconds.